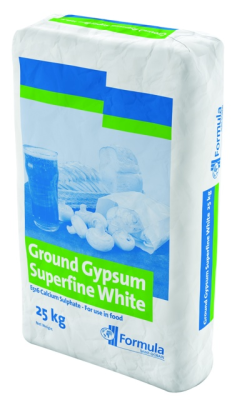 Ground Gypsum Superfine White - Industrial Plasters Ltd. Ground Gypsum Superfine White can be used as an economy resin filler, it is very fine and off white in colour. Ground Gypsum Superfine White is an extremely high purity, micronised gypsum grade, obtained from naturally occurring mineral. Ground Gypsum Superfine White is used as a food additive (E516) food processing aid, so is suitable for baking, milling, brewing etc. It is also used as an additive for accelarator of setting time or filler in tile adhesive and crack filler formulations, as a filler in polymers and other compounds as an extender in paints, in the formulation of oilwell drilling muds or as a formulant in fire retardant loft insulation and sacrificial anodes. Ground Gypsum Superfine White can also be used as an absorbent and as a carrier for insecticides or in fertilizers for Agriculture and Environment applications. Ground Gypsum Superfine White is the product often referred to as gypsum or calcium sulphate in beer brewing literature.